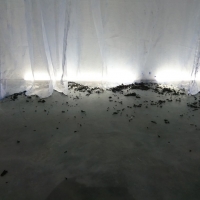 Installation about identity and fragility. To create this installation I have collaborated with Fien Van Rostenberghe. Fien shows her 4 poems to the public, I show my 4 poems from the time I was 18 years old. 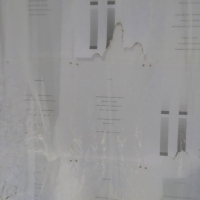 The poems are hanging on the wall, partly burned. We both show these fragile written words for the first time to an audience. In the exhibitions space you can hear the song we have created together. Fien plays the instruments, mixed with audio taped inside my artstudio. I sing.